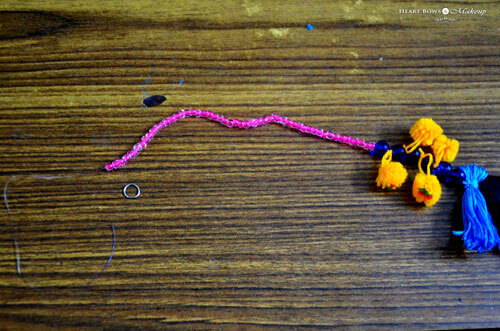 Home » Accessories » DIY: How to Make Colorful Pom Pom Jewellery at Home-Step by Step Tutorial! Pom-pom jewellery is one of the latest trends in the fashion industry. It is funky yet elegant making it a must have in every girl’s wardrobe. The colorful jewellery compliments summer outfits really well be it a crisp white maxi, a printed cold shoulder top or even a simple tank top. 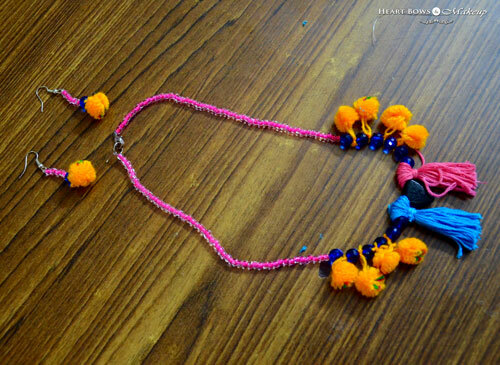 It is very easy to make such boho pom-pom necklaces and earrings at home. Here is a detailed step by step tutorial on it. How to Make Easy Boho- Pom Pom Necklaces at Home! For the pom pom jewellery, we have used two kind of pom poms, the first are cheer ball pom poms (easily available in the market) and the other are tassel pom poms which can be easily made at home. Take a thread and cut it at the length you want. Next, tie one end of the thread to the necklace clasp (these clasps are easily available in the market). 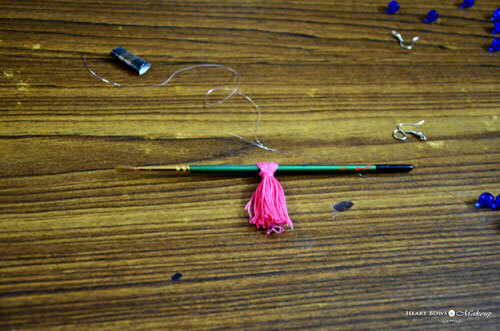 From the open end, start putting beads in the thread as shown in the picture below. 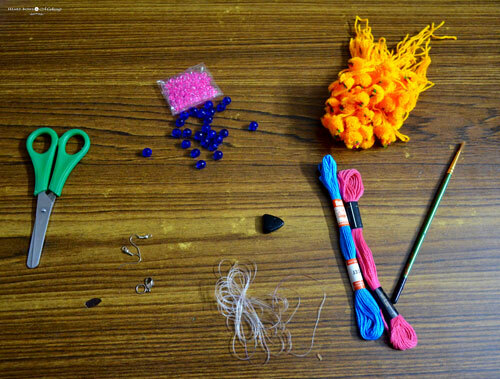 You can now start adding the pom-pom balls; this can be done by tying the pom-pom ball to the thread. We have used blue beads on both sides of the single pompoms, you can also use multiple pom poms together as well. To make the tassle pom poms, use a long anchor thread approx. 2 m & wrap it around your finger and a stick, like a paint brush for instance. Leave approximate one and a half inch gap between your finger and the paint brush while wrapping. Next, take a new piece of the same thread and wrap it in the opposite direction to secure the thread. Finally tie a knot to lock the thread together. Cut off the end wrapped around your finger as shown in the picture below. Your DIY pom pom is now ready. Pull the pom-pom out of the stick and you can see a loop has been created. 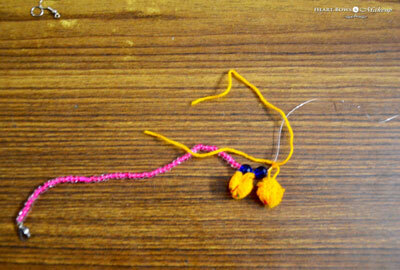 Put the necklace thread through the loop and complete the necklace by putting the rest of the beads and pom-pom balls. 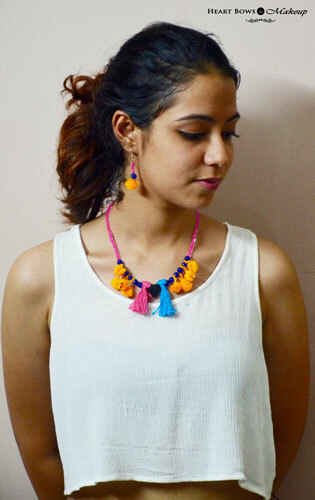 Voila, you easy boho pom-pom necklace is ready! The same steps can be followed to make other jewellery items like rings, bracelets and earrings. This necklace has a tribal touch to its making it a versatile piece which can be worn with western as well as ethnic wear. • Use cotton threads to make tassel pom poms to get the fluffiness. • Always tie double knots to secure the necklace.